View popular related items on eBay. Is there a better alternative to Popular eBay Items Widget? Is Popular eBay Items Widget really the best app in Libraries category? Will Popular eBay Items Widget work good on macOS 10.13.4? 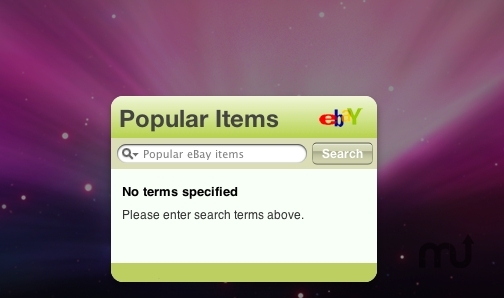 Popular eBay Items Widget lets you see what's moving and shaking on the web's largest auction community. Now you can keep track from your Dashboard. Enter a search query to see the pertinent information on the most popular related items on eBay; if anything strikes your fancy, a single click will take you to the detail page. Popular eBay Items Widget needs a review. Be the first to review this app and get the discussion started! Popular eBay Items Widget needs a rating. Be the first to rate this app and get the discussion started!